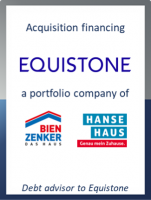 GCA Altium acted as debt advisor to Equistone Partners on the acquisition of market-leading prefabricated home manufacturers Bien-Zenker and Hanse Haus. The seller is the Munich-based industrial holding ADCURAM Group AG. The involved parties have agreed not to disclose the purchase price, and the transaction is subject to competition and regulatory approval. Bien-Zenker and Hanse Haus, both based in Germany, design, manufacture, sell and build prefabricated homes in Germany, Switzerland and the UK. With Bien-Zenker, Living Haus and Hanse Haus, the group owns three renowned brands with high quality standards and offers a complementary range of houses – from the entry level house with a high proportion of self-building to individual and luxury turnkey solutions. For the year 2017, the group is projected to generate revenues in excess of EUR 300 million. Bien-Zenker, based in Schlüchtern, is one of the best-known German prefabricated home brands. The company, which is more than 100 years old, has grown an extensive sales network throughout Germany and is strongly positioned, especially in the mid-price segment. Bien-Zenker is also one of the pioneers with regards to sustainability within the prefabricated property space. Most recently, Bien-Zenker had launched the independent Living Haus brand on the market and thus expanded its product range. Living Haus aims at quality-conscious but price-sensitive customers with its "self-building house concept". Hanse Haus, based in Oberleichtersbach, has, since its foundation in 1929, developed from a carpenter's business into a full-service provider for turnkey, high-quality prefabricated homes. With its portfolio, Hanse Haus operates in the medium and higher price segment. Stefan Maser, Partner at Equistone, said: "The highly fragmented prefabricated home market offers great growth potential. Bien-Zenker and Hanse Haus as well as the Living Haus brand are all players with very strong market positions. We want to build on this, above all by driving organic growth across the companies." GCA Altium provided debt advice on all commercial aspects of the acquisition financing and secured a competitive debt package which reflects the company’s specific requirements. Thorsten Weber, Director at GCA Altium, commented: "It has been a pleasure to advise Equistone on this exciting, high-profile acquisition. Due to the tight timeline of the M&A transaction, we ran a competitive and time-critical financing process and selected a financing structure which not only reflects the future growth plans of the group but also allows high flexibility."